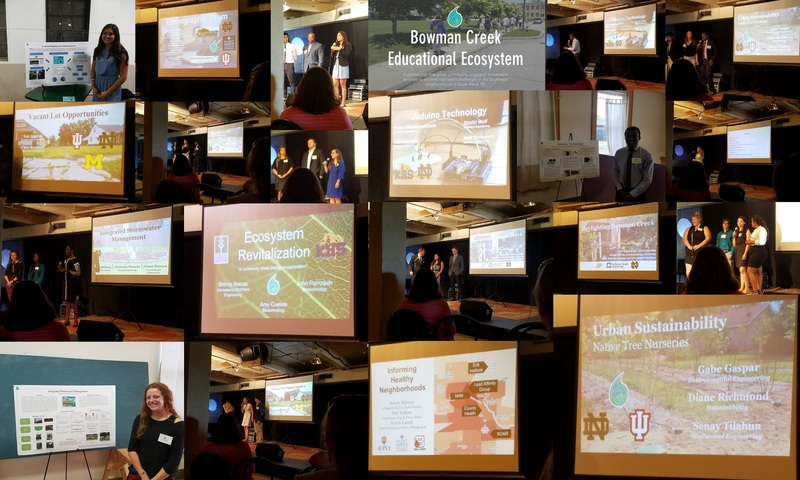 I was invited to attend the Bowman Creek Education Ecosystem (BCe2) Final Presentations on Wednesday, August 2, 2017 at Lang lab here in South Bend, Indiana. It was the culmination of a unique summer internship experience and featured brief presentations from 30 interns, followed by a poster session through various spaces in Lang Lab, showcasing the work the interns have embarked on during their 10-week journey with BCe2. Projects included daylighting Bowman Creek, managing vacant lots, smart green infrastructure, storm water management modeling, energy efficiency, Arduino technology, informing healthy neighborhoods and DNA barcoding. Information technology permeated many aspects of these projects. Several of the intern projects were continuations of classroom themes that were started in the Community Based Engineering Design Projects course partnership with SAP which included students from multiple engineering majors at the University of Notre Dame. This project-based course combined theory and practice to give students the opportunity to apply their engineering curriculum to real projects with transformative impact in a community. Students were paired with mentors and community partners to work on projects that impacted the South Bend region and beyond. SAP’s Design Thinking methodology and assets were fully integrated into the course. The Bowman Creek Educational Ecosystem is a partnership that pilots community-engaged, sustainable projects to address real world challenges in the Southeast neighborhood of South Bend, Indiana. The model of an educational ecosystem brings people from different backgrounds and different sectors — educational institutions, local government, and community organizations– together to tackle a community’s most challenging problems. It started in the Southeast neighborhood of South Bend, where the revitalization of Bowman Creek catalyzed the work and shaped a commitment to social, economic, and environmental sustainability from the very beginning. This same framework is used in a variety of projects, working with neighborhood residents to build a shared community. Currently, the centerpiece of the program is a summer internship, now in its third year. It focuses on regional talent development, with the current intern team comprised of students from 13 local universities, state college campuses, community colleges, and high schools. The interns are studying 13 different disciplines, and the belief is that success stems from the variety of perspectives that team members bring. An internship like no other, BCe2 provides an environment where students can take risks, exercise creativity, and apply what they learn in the classroom to create real impact in the community. South Bend Mayor Pete Buttigieg recently spoke about the Bowman Creek Educational Ecosystem on Charlie Rose’s talk show. The Bowman Creek Educational Ecosystem is a wonderful example of applying Next-Gen talent to the most challenging urban problems in the spirit of the United Nations Sustainable Development Goal 11: Sustainable Cities and Communities – Make cities and human settlements inclusive, safe, resilient, and sustainable. It was a great privilege to see the amazing work of these impressive students. how SAP is helpful in retail sector ?